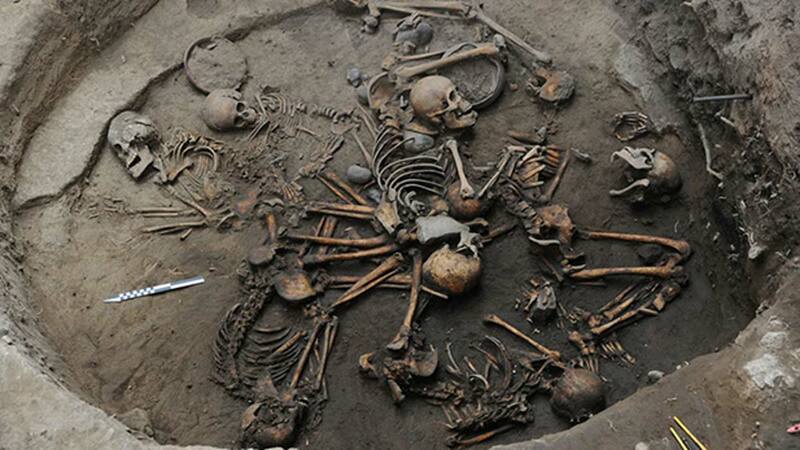 Ten ancient skeletons have been unearthed in Mexico this week including a baby of around one-month-old! Ritualistically deformed, in that their skull shapes and teeth had been altered, they were arranged in a spiral shape with interlocking arms - confirming that they were buried in some sort of ancient death ritual. Estimated to be over 2,400-years old, this occult discovery is creating a typhoon of ideas in the archeological world. According to a BBC report, archaeologists from the National Institute of Anthropology and History (INAH), who are excavating the grounds of the Pontifical University of Mexico (UPM) in the borough of Tlalpan in southern Mexico City, discovered the skeletons under a building that once served as “classrooms, chapel as well as dorm room for the priests.” Bone dating revealed the people once belonged to the Pre-Classical period in Mexico around 1600 BC, predating the rise of the Aztec Empire. The bodies had been “buried with cajetes and tecomates - earthenware bowls and pots of various sizes” and some of them grasped “stones or ceramic spheres,” according to the BBC. As early as 1400 BC this part of the Valley of Mexico was populated and according to Mexico News Daily “this discovery is significant because It’s the first time archaeologists have found a grave containing such a large number of people, in this area.” The archaeologist who heads the INAH team said in a prepared statement “the discovery and ongoing excavation of the site could be of equal importance to the study of the pre-classical period in the Valley of Mexico as digs that were completed between 1960 and 1990 at sites including Tlatilco and Temamatla.” Adding to the unfolding mystery, researcher Escamilla said that her team has “found more than 20 graves at the UPM site, of which six contained the remains of a single person” and she explained that the graves were dug as perfect circles, with diameters of up to 2.3 meters” according to Mexico News Daily. So what are we to make of all these ancient spirals and circles? This is where archeologists take a step back! They know that any, and all efforts to interpret what a spiral grave of skeletons actually meant to the people who created it, are futile meanderings in one’s creative imagination! Many experts are convinced spirals represented water in Ancient Mexico, while others believe they are the circumpolar stars wheeling around the pole star. Others will tell you they generate, or contain, powerful Earth energies where a dryer expert might see them as simple references to swirling winds that affected hunting and fishing efforts. What the spiral grave burial meant to its designers, we might never know. But what we can take from this incredibly thought provoking discovery, is, reaffirmation that our forebears had developed not only a set of rich cosmological beliefs, but that they had managed to simplify them and express them in the most simple, mystical and natural of all symbols - the spiral. "Rock Art of Latin America & The Caribbean" June 2006. p. 5. Archived (PDF) from the original on 5 January 2014. Retrieved 4 January 2014. James Mccanney (nuclear physicist, mathematician,archeologist etc) has proven without a doubt last year that the Nasca Lines are for communication off into space. He also worked in telecommunication industry and says they are constructed exactly like a fractal antenna in your cell phone. They are powered by atmospheric electricity.